By combining red and white LEDs, the FL11 Headlamp is a great when you need bright illumination or need to work in situations while preserving your night vision. Using our Utility Beam Optics, this headlamp produces a diffused beam best suited for up close work. With Coast's commitment to quality, the FL11 Headlamp is impact resistant, weather resistant and its LEDs are virtually unbreakable. Tested and rated to ANSI/FL1 standards. Harnessing the Pure Beam Optic with the ability to twist focus, the G50 Flashlight is a workhorse for daily use in a variety of distances. While in flood mode, the light casts a huge circle of light that is equally bright across without any dark spots. Then twist it into spot mode and the light will reach far downrange with a transition halo that allows for a large viewing area surrounding the tight spot beam. With Coasts commitment to quality, the G50 Flashlight is impact resistant, weather resistant and its LED is virtually unbreakable. The G50 Flashlight is backed by Coasts lifetime warranty against defects in materials and workmanship. Tested and rated to ANSI/FL1 standards. Enr Hardcase Pivot Pro is rated 3.2 out of 5 by 6. Rated 1 out of 5 by Anonymous from I love this light I ordered this product and came defective twice had it once loved it but come on two orders and both defective big waste of time. Rated 5 out of 5 by ghaieldiah259 from This is the best flashlight I have purchased for tent camping. What a wonderful flashlight this is for camping. The higher beam is perfect for backwoods which is usually where I camp. I also like the red flashing light in case of needing help on the road or in the woods. The clip securely attaches easily to my belt or pocket and even in the roughest hiking it stays securely: a huge plus in the deep woods. Also, the flashlight does come off the belt/pocket with ease if I want it to come off. The flat bottom and swivelhead make it handy in the tent or at the stove. I bought 1 of these for myself as an anniversary gift and it was a delight to use. I looked for it at Christmas but was unable to find another so I eventually ordered 3 more so each of my family members could have one and I keep an extra in my truck. Thank you for an excellent product with excellent durability and function. Rated 2 out of 5 by baldscreen from LED Flashlight I picked this up on somewhat of a whim and plan to take it back in the near future. I wanted an LED flashlight to use around the house that had some candle power to it. Unfortunately, the electrical contact surfaces in the swivel head aren't very good and the light dims or fades out completely on occasion. Usually at the worst possible time. The belt clip on the side is worthless because it is too stiff. Rated 5 out of 5 by Tamaracian from Very Bright Multi-Function Rugged Ergonomic Flashlight This Flashlight's primary CREE XRE LED is very bright (75 Lumens on HIGH) and has a well-focused beam. There are 2 Red LEDs for Night Vision acclimation, and a Green LED for inspection purposes (shows defects like cracks with better clarity than white or red lighting). The Switches are sealed alternate action. The fit in your hand--Ergonomics--is very good and comfortable. The Flashlight stands upright, or lays flat. The Head swivels vertically through 125-degrees (with ratchet detents to stay in place) so that the beam can illuminate an object lying flat while the Flashlight is on end. There is a metal Belt Clip for hands-free carry which is very helpful if you are in a dimly lit area and have your hands full with tools or supplies. There is also a Loop for attaching a Lanyard or Rope for hoisting or suspension. The Flashlight is rated for protection against splashing water and drops from 20 feet onto concrete. 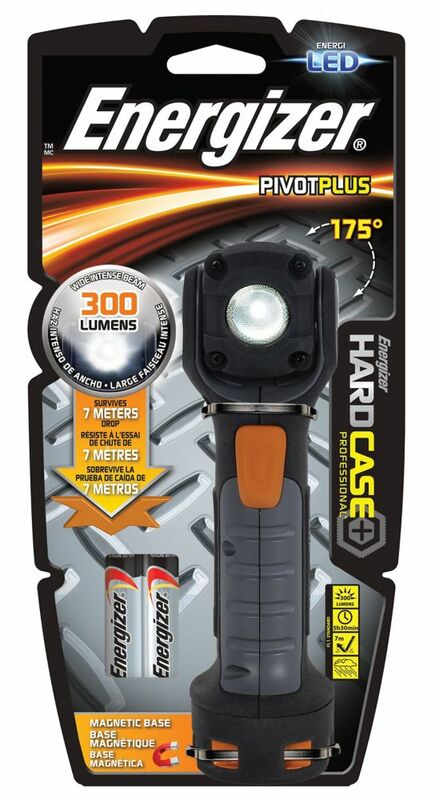 I highly recommend the Energizer Hardcase 2AA LED Swivelhead Flashlight TUFSW21P. Rated 1 out of 5 by RickW from worst flashlight ever This flashlight was purchased to use on my school bus during hours of darkness. The batteries supplied with the flashlight were dead when put inside it, I changed batteries and had the bulb burn out. The head wouldn't swivel nor would it stand up as advertised. Returned this flashlight back to the store for a full refund. Replaced it with a quality Mag-Lite flashlight for about the same price. Rated 5 out of 5 by CaptainKirk from Excellent flashlight!! Great light both high and low mode. Like the red night vision. The swivel head provides an option you can't get with a regular flashlight.